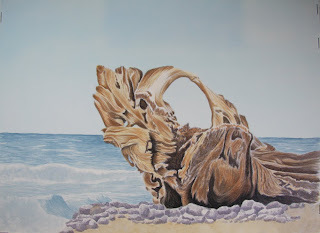 This is a painting I am working on right now of a piece of driftwood. I really like all the twisty shapes in the wood and how it still reaches out to the ocean even though it is stuck on the seashore. The original reference photo was taken by a very talented photographer, Tom Burke, who was nice enough to let me use his photo for the painting. In the actual photo the wood is much more gray but I wanted to show the richness and warm so I have warmed it up considerably.